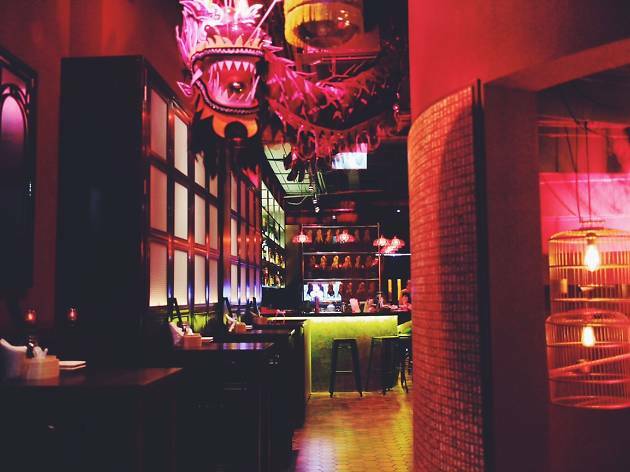 Leering at you from the street with its neon pink-lit lobby is three-storey dining and drinking complex Sum Yi Tai, put there by Coterie Dining Concepts, a collaboration between Tay Eu-Yen and Sandra Sim formerly from the Butter Factory Group, and Cantonese restaurant owner Ricky Ng. 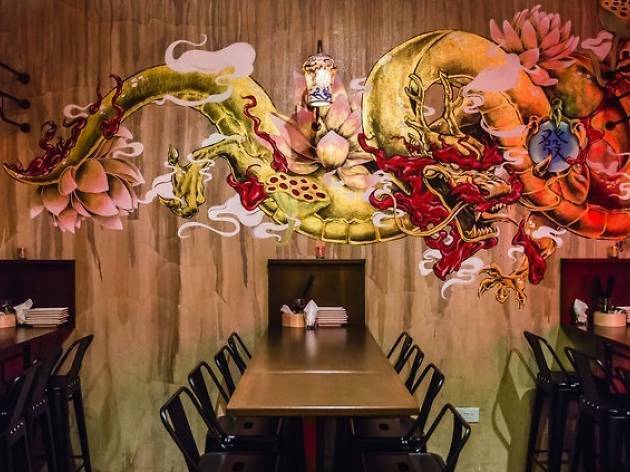 There's much to say about the décor, which bears the kind of defiant cheek that you'd imagine a fiercely street-smart third wife of a Hong Kong power broker type character might get away with. 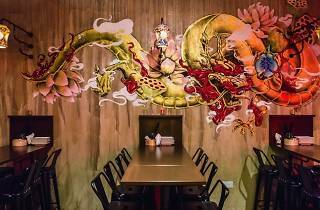 From its ceiling perch, a Chinese dragon in mid-dance dares you to enter. Life-sized vinyl roast ducks hang like just-roasted meat on a side wall of its ground floor tapas bar. And a proud display of CD cases of such ’90s icons like Andy Lau, Jacky Cheung, Michael Jackson and NKOTB explain the soundtrack for the room. All this is washed in the stark glow of Hong Kong butcher shops on the ground floor. A lift ride up takes you to a dining room on second – opening this month and serving lunch sets and the same tapas as the other levels – and a private rooftop bar where you'll have to email your request for access beforehand. On a quiet night, it was easy enough for us to park ourselves on the open-air top floor, which is a calmer assemblage of darker woods and textured green glass and a worm's eye view of nearby CBD towers. Sandy, Faye, Leon and their fellow belters fill the air with a retro vibe, though the drinks are anything but. Cocktails like the Chinese Mojito ($21) and Date a Gangster ($21) push their tattoo sleeve-shirted barman to incorporate chrysanthemum and red dates with potent alcohols. The former is a beautifully complex drink that turns bitter-fragrant, citrusy then finishes with the lightest breath of mint, while Gangster counters a weaker backbone of whiskey and Drambuie with sweetness. If you're not much of a reader, make exceptions for Sum Yi Tai’s 12-strong cocktail list – each drink carries through a narrative of a powerful love affair between a loyal wife and triad troublemaker. It's playful and takes the attention to detail to levels of impressive. Many other pages of the menu are dedicated to a dominantly Asian list of whisky and whiskey, with the likes of Yamazaki 12 ($24/glass, $338/bottle) and 18 ($32/glass, $658/bottle), Miyagikyo ($16/glass, $298/bottle) and Taketsuru 17 ($20/glass, $338/bottle). There are separate menus for wine ($14-$18/glass, $58-$588), with half bottles ($30-$45) for lighter drinking. 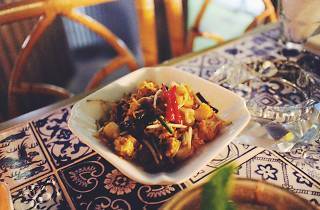 For a full meal, hike up to the elegant dining club on the second floor to sample from both Sum Yi Tai’s tapas and à la carte menus. 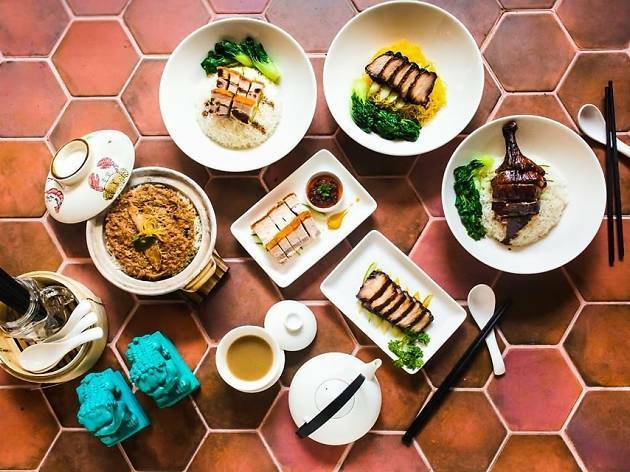 We recommend the whole roast quail with five spices ($18) and the slow-roasted suckling pig ($29), both of which hide juicy meat under the firm snap of crackling. 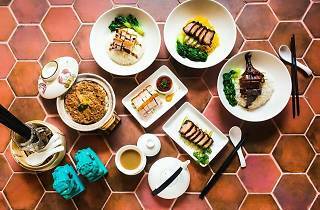 The dining club also dishes out set dinners ($68-$88) whose highlights include Boston lobster noodles in XO sauce and the curiously named ‘Singapore fried rice’, which Sum Yi Tai describes as a Cantonese-by-way-of-London dish (it’s fried in curry powder, and comes with prawns and char siew). 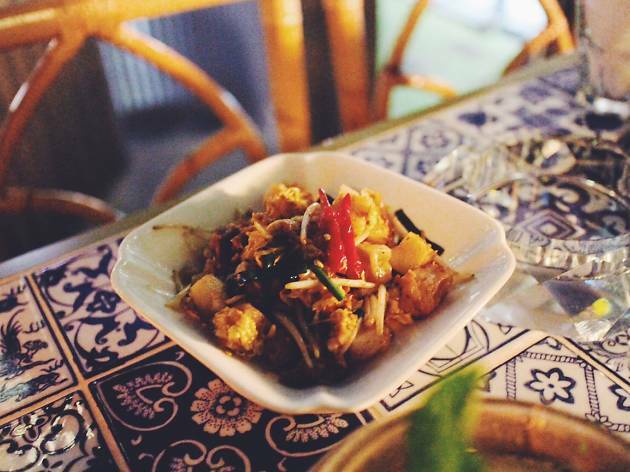 The concept here is firmly Chinese-Cantonese, but it's hardly a lapsap (skeezy) experience. 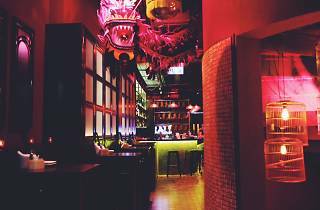 Sum Yi Tai speaks well for a growing trend of Asian-proud bars and we can't wait for more to follow suit.